Roofing Services | Clearwater, FL | Dynamic Roofing Concepts Inc.
There’s nothing that can keep your home, business and investments protected as well as a sturdy roof over your head. At Dynamic Roofing Concepts Inc., we are a roofing contractor that takes great pride in ensuring that every Clearwater roof that we do is the best in the entire Tampa Bay region. We offer the highest quality service combined with top of the line name-brand products to ensure your roof is safe, strong and lasting. Products and Services Offered by Dynamic Roofing Concepts Inc.
We are a family owned and operated business and have worked on literally thousands of roofs in the Tampa Bay region. Our team is comprised of highly skilled, honest and ethical professionals. Each member of the Dynamic Roofing Concepts Inc.’s team has passed the GAF competency exams for roofing, and they are also certified in Hydro-Stop Elastomeric roofing systems. There isn’t anything we haven’t seen, assembled or fixed when it comes to roofing. We are truly experts in the field. 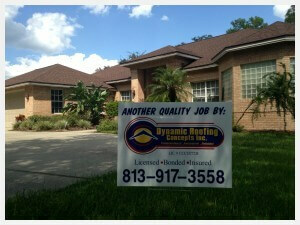 Let us show you the Dynamic Roofing Concepts Inc. difference. With our extremely high commitment to quality, a team comprised of knowledgeable and experienced roofers and a variety of product options to choose from, we are definitely the right choice for Clearwater roofing companies. Call us today at 813-657-7663 to get started. We also have a convenient online form available for an estimate request. Fill out and submit the form and a member of our team will be in touch with you shortly.